“How can I not? My repeat circuit keeps showing Chrome and Pewter pissed because I mistook them for Dead Betas. What bot rests? Only boosted their Slether so I can sell it to buy more appendage junk. Hey, they’d do the same to me! And yes, I’m an idiot ’cause I didn’t think they’d have the sense to bury a tracker inside the Slether pack. So, I’m taking it…there,” Rathwalston said, pointing out the porthole to a grim, scarlets-shadowed planet. “You lost it in that poker game last night. Now I’m wearing it,” he said, glancing at the lower part of his mechanical torso. Meanwhile, Biff struggled with the primitive controls on their stolen ship, a hacked-together collection of gear shifting rods, a metal pegboard box passing as a control panel and a window with a target drawn on it. A few dials sporting unrecognizable symbols proved to be a complete waste of time, signifying nothing useful, to him anyway. He might as well fly blind. After much jiggering, he figured out the correct joystick to turn it towards the unnamed planet only meters away. “If either of you loose screws wants to pay attention, we’re here. We got an hour, tops. Time to go,” said Biff to Rathwalson. “I’m already gone. Catch you in five,” Rathwalson said as he slipped through the portal. Biff and Thurston watched him stream towards the planet’s surface, leaving a faint trail of propulsion fuel in his wake. Nothing but a sizzle crack of dead air. “I’ll keep watch. Not that we’re a tempting target or anything, but even if Pewter and Chrome are in a good mood, they’ll pick us off just for laughs. I mean, look at this ship,” he said, slapping the metal pegboard box that held the control panel. Moments later, he disappeared into the dark abyss, floating towards his destiny. Nothing works like it’s supposed to, thought Biff as he scrambled along the rough surface of the unnamed planet. The tracker’s sending me here, but I’m not picking up signs. Without warning, the sky erased it stars, replaced by a great gust of wind, then darkness. After a few foggy minutes, he regained his senses and glanced at his biometer. Oxygen…that’s good. He slipped off his helmet and breathed fresh air. A clink, followed by a ka-terrk, ka-terrk, ga-wheee sound caught his attention. Leaving his helmet, he raced towards the noise. 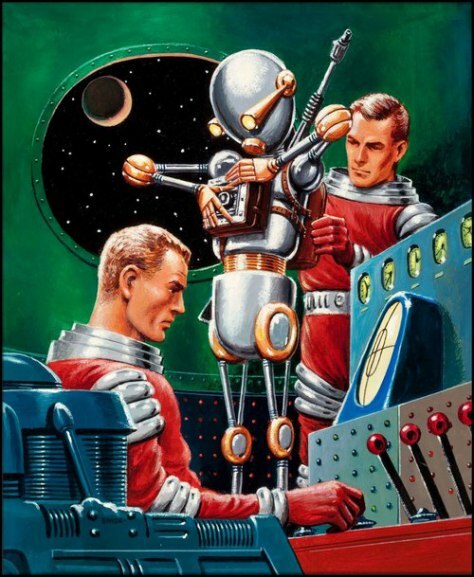 There stood Pewter and Chrome, disassembling a sizable assembly of bots. Among them was Rathwalson, his various pieces carefully arranged in categories: appendages, intelligence, camera, receptor, and others. That packet of Slether joined others in a bin. 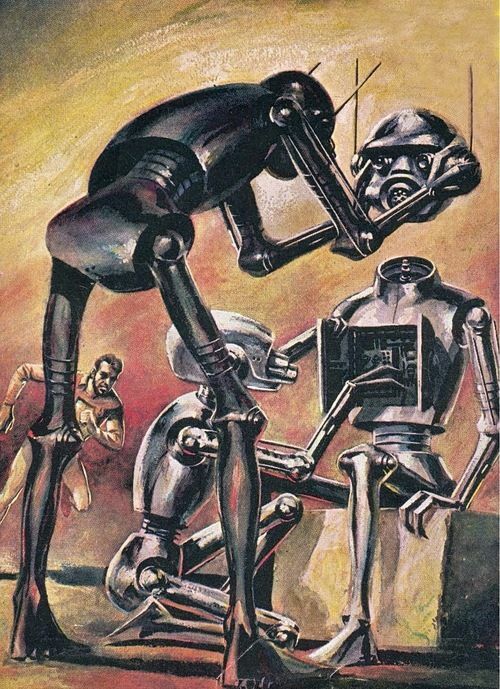 “What took you so long?” said Pewter, as he turned toward Biff, pulling the head off of another bot while Chrome dissected its innards. “That wasn’t our agreement. You know all the trouble I went through to get this stuff?” said Biff. “Time to go,” said Chrome, as he rose up from the ground. “But…but…” Biff whimpered, until he felt the cold metal finger touch his cheeks. Chrome unscrewed the cap that once served as Biff’s head, placed it on a shelf, and dug within his interior, scooping out the piles of packets of Slether that Biff held captive for far too long. It was time for him to go.